Basement clean out. What a mess. And, what a big time job to pull off. Yes, it will take plenty of time and effort. But, if it’s done right, will payoff in the long-term. Especially if you’re going to finish the space to remake it into usable living area, adding more function and value to the home. So, be sure to plan accordingly and think it over before you rush into it. Then, take a look at some of these basement clean out tips and tricks. Before you start hauling things out of the space, consider what you’ actually use it for. 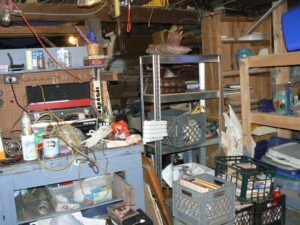 Don’t make the mistake of doing a complete basement cleanout only to waffle on what to dedicate the space to do. If you don’t have a clear plan, you’ll eventually wind up doing the same thing over again. Which means going right back to where you are now. So, consider what practical uses you can get out of it. For instance, a few basement finishing ideas include: making it into a utility room. Or, you can take it a step further and go for a game or media room. Another idea it to create a revenue stream with a basement apartment conversion. Yet another idea is to make it into a dedicated entertainment space for guests. Create a clear pathway. The first thing you need to do is create a wide walkway so you can move things out freely, without tripping hazards and other obstacles. Let others know what you’re doing to avoid problems. Purge, purge, and purge some more. Once the basement is empty, it’s time to purge with a vengeance. To provide yourself motivation, just keep in mind that what you keep you have to find room to put back. When you need basement clean out done right, just phone 800-433-1094 or visit Junk Garbage Removal.